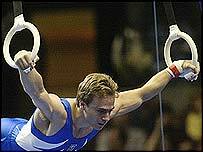 Dimosthenis Tampakos claimed gold for host nation Greece in the final of the rings gymnastics competition. Tampakos was under intense pressure to go one better than his silver in Sydney but he managed to remain composed and gave a near flawless exhibition. He nailed his dismount and stood fists clinched until he was able to celebrate his winning score of 9.862. Jordan Jovtchev, of Bulgaria, took the silver, while five-time world champion Yuri Chechi, of Italy, clinched bronze.